I have had my wire-strung Kilcoy harp for about a decade, and in all that time, I've never had a string break. I had one go just before the winter solstice, and I had another go last month. Well, I said to myself, maybe ten years is just the lifetime of these bronze strings. They'll all be going soon. I took out my poor neglected instruments two nights ago to tune them up. Both were about two tones flat! I started tuning, but it seemed really hard to raise past a tone - so, not wanting to snap strings, I left them tuned a tone flat. The next night, I raised another semitone so that I was only a semitone flat. Almost there. The third night, last night, I sat down to bring them all up to tune. I took up my electronic tuner - and stopped. The temperament indicator wasn't 'PG,' the Pythagorean I usually use. As I cycled through my options to set that correctly, I noticed that the calibration indicator was no longer set to A = 440 Hz. It was some random number like 483 Hz. A memory came back to me in a flash - taking the tuner away from one of my boys, telling him to stop pushing buttons. I cycled the calibration back to 440 Hz and picked up a harp. Sure enough, I was a half-tone sharp. I relaxed all of the strings and, except for the new string that's still settling in, everything was in tune. If I've been tuning almost an entire tone above where the harp is supposed to be tuned to (B = 494 Hz), no wonder I lost two strings! Marion Quyn of Bhakhail has a page on making a sheep bone whistle. Different resources than I have, also ended up using beeswax for a fipple. Interesting technique to fit the fipple! If I am very lucky on at least two fronts, I might be able to take a class with her about it! Look! After dragging my feet forever on a lyre book - a lyre video! It has its flaws, certainly - glint, top of my head cut off, et cetera - but I wanted to just get started instead of re-doing it forever and ever, amen. So Sunday, I went to the re-opening of Montpelier Mansion just because. And lo, the gift shop had an assortment of the wooden craft stuff you see at Williamsburg, including a signal whistle. So I picked up the whistle so that I could study it at home at leisure. Using a flat file across the upper (mouthward) edge of the blowhole, flattening it and deepening it. Using the same flat file to slope the edges of the blowhole. Shallowly - not the 45 degree angle on the Williamsburg model - but the whistles in my bones book look shallowish, too. Also, the bone isn't round, it's flattish. Removed the fipple and deepened the airway, aiming for twice the depth of the blowhole. But by gum, it looks more like a proper flute blowhole now. Maybe I should give the PVC pipe another go? Verdict: Mostly failure. The whistle (I was aiming for one note) is hissy, not piercing. Something is wrong. It may be too small (my book on bone, antler and ivory artifacts only shows bigger whistles). Also, I still managed to cut the blow hole backwards. Cooked bone is easy to shear and easy to cut with a paring knife (I "drilled" the holes with the tip of a kitchen knife). Next time, buy pipe cleaners. Pay attention to which parts of the bone are flat, and which are rounded. Blowhole should probably go on the flat side, right? I ordered 3oz beeswax from The Bee Folks for my whistle project. It came the other day, and I promptly began to try to jam it into the flute to make a fipple. I heated it in the microwave in 15-second bursts until the 1oz cake was soft around the edges, then twisted off a piece to work with. It was easily pressed into the tube until just visible through the blow hole. 1. Force wax into whistle. 2. Let cool and harden. 3. Remove, shave off wax to form airway. was probably the way to go. The beveled edge of the blow hole might not be sharp enough. The D-shape of the blow hole isn't as D-like as it could be across the flat side. I could file that down. When the pipe was cut into lengths, the plastic sort of got dragged by the saw blade down across the diameter, so there's a lip there now. The wax is shaped by the lip into a cylinder a little narrower than the actual inner diameter of the pipe. Maybe I need to clean that all up. For a 'simple instrument,' this is surprisingly hard! Many thanks to Dave C., who emailed me a whole passel of articles on pre-Conquest and medieval bone flutes! Indeed, I jumped the gun a while back. Just because the 40,000-year old flutes were notched and end blown doesn't mean the Anglo-Saxon ones were and, indeed, the archaeological finds seemed to all be fipple flutes. I have to go over the articles in-depth, but some measurements jumped out: a fairly intact, large specimen 19cm long and about 11mm in diameter. That's about a pennywhistle with the last three holes cut off. Remember the PVC pipes I bought back in March? Finally hauled one of the smaller diameter ones out and drilled two holes in it, near either end. I used a mitre box and saw to try and turn one of the holes into a D-shaped blow hole, then used a small square file to file down the edge. It looks about right. No fipples survive; beeswax has been suggested as a possibly substance that would conform to the irregular inside of a cleaned bone. I don't have any beeswax, but thanks to having two small boys, I have an abundance of Play-Doh. Play-Doh does not make a very good fipple, at least not right off the bat. It's too soft. I can plug up the entire end of the flute with it, but when I try to make that tiny channel for air along the top, everything just goes squishy. Maybe I should make a plug and let it air-dry, then file off a flat spot? It'll shrink as it dries, but a thin layer of fresh 'Doh ought to make up the difference. In other news: Lyre! Hoo boy. The call for class proposals for Fall University has gone out, and I think I want to teach a lyre-playing class. I know of at least three gentles in Atlantia who have found the lyre on their own; perhaps there are others who would be interested in giving it a try. Now, to teach lyre playing, you need some lyres. 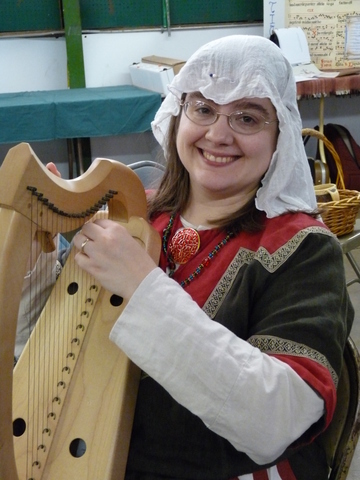 I asked the folks on the Anglo-Saxon Lyre Group for some advice. I was getting ready to try and make some resonator-less lyres (boards with hand-holes and strings, essentially), when Master Arden of the East mused that it might be even easier to nail together some wood in the appropriate shape. Bless him, he even provided notional sizes of the wood needed. I sure wouldn't have had any idea. Poplar 1" x 1" x 3' - to be cut into lengths the width of the lyre. One at the top, one at the bottom, one at around the middle. Poplar 1/4" x 1.5" x 2' - The sides of the lyre. Couldn't find any small craft boards that were exactly 1" to match the cross-supports. Beech (? I have to check) 3mm thick plywood - from a craft store. Soundboard and back of the instrument. 1/4" x 5/8" rectangular basswood dowel - for bridge. Grabbed at the last minute in the craft store; I worry the basswood will be too soft. 5/8" round dowel and brass flat-headed screws - possible tailpiece assembly. The other advice I got was just to put in small escutcheon nails and tie the strings directly to them. Got sandpaper, polyurethane spray, etc. Still need: zither tuning pegs, fluorocarbon strings. (60-80lb, 40lb and 30lb test are decent starting points, apparently).